Josh Hagins become a household name on his birthday when he helped his No. 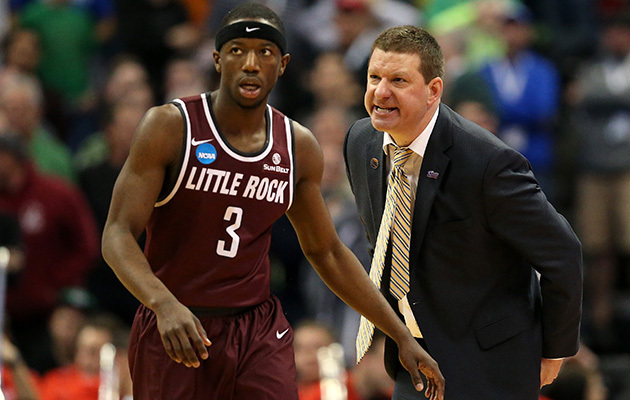 12 Little Rock Trojans upset No. 5 Purdue. DENVER — Can you imagine a roster blueprint less confidence-inspiring than this one? A Division II coach takes over a 13–18 Sun Belt program in April 2015, retains seven of its players and brings in 10 obscure newcomers in a matter of months—four of them D-I transfers, four of them from junior colleges, one from D-II, one a freshman. These are the misfit teams that go on to have forgettable seasons. These are not the teams that go on capture the hearts of the nation, for a few hours on the opening day of the NCAA tournament, in an 85–83, double-overtime upset of Purdue. They were all intrigued by their new coach, even if he was a little crazy—the kind of guy who would later tell them to act “like street dogs, not pet-store dogs,” and who during the Sun Belt Conference tournament would break his right hand hitting a locker-room whiteboard. On the retreat, Beard brought the team over to one of Petit Jean Mountain’s ledges, and placed a long, wooden board over an open space between two rocks, with a steep drop-off below. Beard pulled the board away from the ledge, to safe ground, before walking across it. The message was conveyed, and the first potential tragedy was averted. Here was that misfit team, on Thursday afternoon at the Pepsi Center, having avoided falling for longer than anyone could've imagined: Little Rock was 29–4, Sun Belt regular-season champs, Sun Belt tournament champs, and a No. 12 seed in the NCAA tournament. But its time had finally come. Purdue, a No. 5 seed with a mammoth front line, was up 63–49 with five minutes left in a first-round game, and the Trojans weren’t offering any reasons to believe in a comeback. Beard laid into Hagins at halftime, too—to a degree that Hagins worried his coach might break his other hand—although it didn’t immediately take effect. With five minutes left, down 14, Hagins had 10 points and the Trojans were still flat. The game was nearly decided; the odds of a Little Rock comeback were about the same as the odds of a team coming off a 13–18 season and adding 10 obscure newcomers had at winning its conference and making the NCAA tournament. And yet, things began to change. Beard had the Trojans begin uncharacteristically pressing the plodding Boilermakers—“Always expect the unexpected,” Beard said of the defensive call—and Purdue started making mistakes. A Hagins steal with 4:11 left was converted into a Hagins three; another Hagins steal was converted into a jumper from junior guard Jalen Jackson that cut the lead to nine (at 65–56) with 3:05 left. A Johnson Jr. steal with 1:33 left turned into another Hagins three, and a turnover from Purdue senior center A.J. Hammons with 1:07 left led to a Shoshi layup that made it, improbably, 65–64 with 55 seconds to go. The previous day, the 6'11"—but only 210-pound—Shoshi had confided to a reporter that when Purdue was announced as Little Rock’s first-round opponent, he was not exactly excited about the prospect of facing a front line of the 7'0" Hammons and 7'2" sophomore Isaac Haas. “To be honest with you,” Shoshi said, “I would have preferred someone else. But hey, we want to play against the best, and it’s March Madness, so anything can happen.” Anything including he and the Trojans holding Hammons (16 points) and Haas (7 points) in relative check with constant double- and triple-teams. And including Shoshi making a three—his lone trey of the game—with 21 seconds left that again cut Purdue’s lead to one, at 68–67. Two free throws from sophomore forward Vince Edwards put the Boilermakers up 70–67 with 17 seconds left, and set the stage for Hagins on the Trojans’ final offensive possession of regulation. Hagins had hit huge step-backs in road wins at San Diego State and Tulsa in November, and with his first-ever NCAA tournament game on the line, Hagins wanted to go back to his (borrowed) signature move. With the clock ticking down, Hagins got isolated on the left wing against Purdue point guard P.J. Thompson, but Thompson forced him back middle, into a shot with a much higher degree of difficulty than Hagins preferred. He did the hesitation dribble with the ball in his right hand, then literally hopped back right onto the edge of the halfcourt logo—and that was the spot where he launched the shot of this young NCAA tournament. When the media was in the locker room later, a Trojans staff member began playing the sounds of dogs barking (a reference to Beard’s “street dogs” motto) on their stereo, and Shoshi announced that it was occasion for a different kind of celebration. Indeed, when a beaming Hagins said, “I’ve been waiting 22 years for this,” he meant 22 years on the dot. After briefly joking that it was a decent birthday (“This is right up there with going to the bowling alley at nine”), Hagins stated it that it was the best birthday of his life. 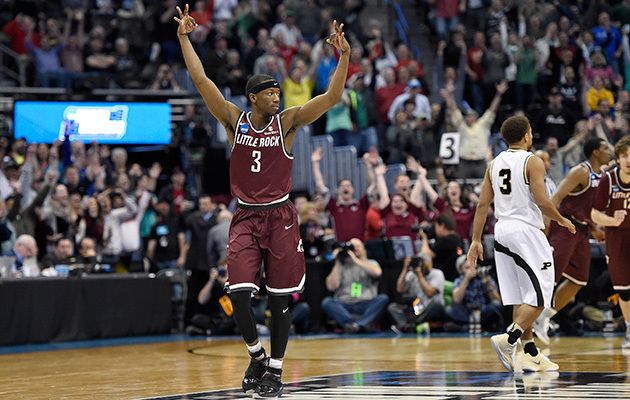 He had scored 31 points, including that absurd stepback, powered the most thrilling upset of the NCAA tournament’s opening day, and introduced himself and Little Rock’s banded-together misfits to the nation in the most entertaining way imaginable. It warranted a bigger party, but with Iowa State and a trip to the Sweet 16 on the line Saturday, Hagins was keeping his plans tame—and staying the course. He said he had discovered the pleasures of cinnamon ice cream on this trip to Denver, eaten it on Tuesday and Wednesday, and planned to get it a third time on Thursday night. He had to stick with anything that might have contributed to him morphing from an anonymous, undecorated guard to the most famous shot-maker of March Madness in 2016, and cinnamon ice cream was possibly one of those things.